I’ll start with the most important news first: Judah’s tumor hasn’t grown since we started chemo! The radiologist hasn’t actually read it yet but we looked at with the dr and you can see it hasn’t grown! We also saw, and the dr confirmed, that there is less contrast (lighting up) so that means the chemo is killing those growing cancer cells. We are so elated! We won’t know if it’s shrunk until we see the radiologist’s report but we feel confident that this MRI is good news! He has already had his labs and anti nausea meds. Everything looked pretty good. The dr said it looked, by his labs, that he is fighting “a little something” by the slight elevations but nothing to be worried about. We did have to have a talk about his weight. He had lost weight…again. Dr pulled up Judah’s growth chart, which I always dread because he hasn’t been on a growth chart since he was 4, and showed us that Judah is in the 0.02% for his age. That means if you picked 1,000 kids randomly, he would be the smallest and thinnest of all those kids. And the kicker is, that he has now lost so much that he is technically considered “failing to thrive”. This wasn’t shocking to us because we have been fighting his weight loss and lack of appetite for 5 yrs. But the failure to thrive was heart wrenching. The dr was quick to tell us that we have done nothing wrong. That gaining weight is hard for a lot of kids with cancer. But also said that we can’t do nothing now. So in the next couple of weeks Judah will probably be getting a feeding tube (NG Tube). For those of you who are medical people, he can’t get a G Tube because the chemo makes it too hard for his body to heal. They can’t do surgery unless he goes off chemo for 4-6 wks. And we aren’t doing that right now. Judah is very sad. He doesn’t want to be “Judah with cancer”. He wants to be “just Judah”. And the NG Tube will be on his face. And people will see it. You can hide a G Tube under your shirt. It’s a bummer. But it’s also necessary at this point. Judah is an amazing kid. He sweet and gets “it” like most kids can’t. He understands he has to have the NG Tube. And he will get to a better place because that is just who God made him to be. Brave and introspective and sweet and trusting. Join us in praying for his heart. And that his little friends can see past the weird tube and treat him like “just Judah”! He finished his chemo in great time and we went down the street to McDougal’s Chicken, before we headed back to Bam’s for the night. We planned ahead of time to stay over night in case judah was sick and boy am I glad we did. About an hour after he finished chemo he started getting sick. We had to rush to the bathroom several times before we even got back to Bam’s. Unfortunately, Judah was sick the rest of the day and into the night. He hasn’t been actively sick today but he also hasn’t eaten much. Thank you for celebrating with us and praying with us. We are grateful for our community! Once the cream did it’s magic, his awesome nurse accessed him, drew labs, and started his fluids. 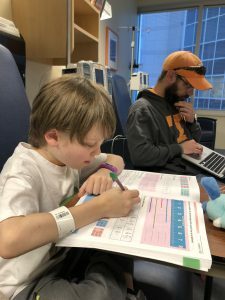 I got out Judah’s school work but before we could get started Child Life came by to tell us some Tennessee Athletes were in the game room doing Beads of Courage bracelets, Judah jumped at the chance to not do his work, and he loves crafts! The athletes were so nice and Judah loved having them help him make a bracelet for himself and his sister! Thank you Tennessee Athletics for organizing a fun distraction for the kids! 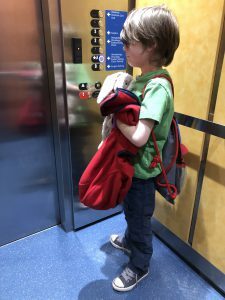 When he finished, we headed back to his room where Judah proceeded to eat 4 bags of goldfish and 2 bags of Cheetos while waiting for his labs to come back. He loves him so salty cracker snacks! Around 11 his labs came back great and the timing couldn’t have been more perfect because his fluids had just finished too! 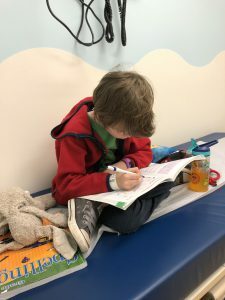 Dr Spiller order his chemo and Judah and I started his school work, trying to finish his math and spelling…which he was not happy about. It took quite a while and a FaceTime call from Daddy to get him to do it. But that seemed to work! Judah’s first chemo just finished at 12:30. We’ll wait for the flush and then hopefully start the next one! So far he hasn’t had any side effects. Keep the prayers coming because they are helping! He is feeling mean though. I would be too though, so I get it! But it’s hard when he being so very hateful. We will continue to ask Jesus to comfort our boy. Continue to pray that the Holy Spirit will help us to be slow to anger and abounding in love. Like He is! Judah’s 2nd chemo is today. Matthew left for another Atlanta meeting at 5AM but thankfully I had some people come together to help me with Camilla Kate and Emmett. We got to clinic at 9:45 and had check-in and labs quickly. All his labs were noraml except he is still a bit dehydrated. Hopefully the orange Gatorade Daddy got him will help him drink more often. Chemo didn’t arrive until 1. It’s now almost 2 so we are about 1/2 way through the first bag. Each bag takes 1.5 hrs. It’s gonna be a LONG day. The nurses brought Judah lunch around noon. Me on the other hand, well let’s just say I’m really looking forward to the dinner from Two Rivers Church Worship Team tonight. So far, the chemo is going well. We’ll probably be here until 5 though. Prayers for patience and stamina! 2nd Chemo is finally done! Going home at 4:30 so my guess was very close! Today was a long long day, but Judah was in much better spirits. He got going quickly on homeschool work and enjoyed the very cool entertainment options at ETCH. Please join us in continuing to pray that Judah would not struggle with side effects from his treatment and that the chemo would be destroy his cancer! There is a heaviness that sits over a chemo clinic. 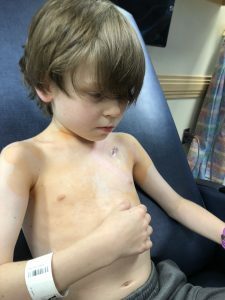 I had forgotten that tight chested, woozy-headed, rapid-heart beat feeling that comes with seeing, not only your own child but a room full of really sick kids, doing one of the hardest things we can do as humans — fighting for the right to live. That feeling is pretty wretched. Seeing and being helpless. Judah was a warrior today. It began with labs at 9am. After everything came back normal, we picked a spot and settled in for a long morning. He ate and drank everything we could throw at him and ask for more! He was very tired but refused to sleep…he’s very stubborn😏 The only real frustratation came when his feet and hands began cramping. 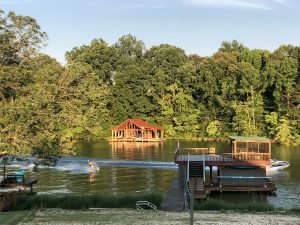 But with flexing, moving, and water it passed. After 3 hrs of chemo, he got flushed and deaccessed and we were free! We will do labs etc next week and then chemo in 2 wks. For now, we ask for prayers that he can go to school, enjoy it, get the work done, and feel ‘normal’ with his friends. Thanks all! We’ve been going hard for the last 2 wks and I’ve not been updating very well. I’m sorry for that. 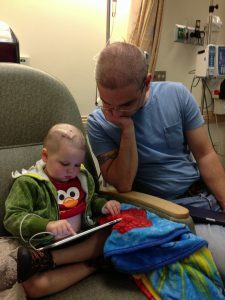 The last 2 wks Judah has been receiving a partial chemo treatment. It is totally normal and part of this first 10 wk run. He had 4 wks of both drugs and these last 2 wks have been only 1 drug, vinchristine. This week he will go back to both drugs for 4 more wks. Honestly, these 2 wks on vinchristine have felt like a break from chemo because the nausea, vomiting, and irritability have been pretty much absent (barring a few instances). The only thing we really notice was his balance was really off. I mean REALLy off. He has fallen a lot so he is covered from head to toe in bruises. So today at PT Julie did her normal feet/leg stretching and did a test to see if he could feel her touching toes/arch/heels and he could on some and couldn’t on some. In watching him walk, climb, etc she said she thinks it could be neuropathy/foot drop. It could also be that his muscles are still redeveloping. Or it could be that where his tumor is located, in the brainstem, it could be causing balance issues too. So we aren’t sure. One of the most common side effects of vinchristine is neuropathy. We didn’t put 2 and 2 together that the off balance could be neuropathy. We thought neuropathy was painful…we are new to this. The one good thing is this mess is that he isn’t experiencing any pain with the neuropathy! Before we started chemo, Dr. Espenshade said that if the neuropathy got bad and foot drop was a more common side effect we would have to switch regiments. We don’t know what that looks like. We don’t know of this foot drop is the beginning of a “more common” or just a side effect. We don’t know if its something to be concerned about or just part of the chemo deal. So we will talk to oncology and PT and watch and see what the next step is to get him in a better, safer walking place while killing this cancer! Last night was thankfully uneventful. He slept great and his breathing was regular. We go to chemo this morning and we will see what Dr Spiller says. This may be related to his mental coordination that his neuro surgeon told us about. If I didn’t explain it earlier, it’s where his brain isn’t capable of managing/controlling 2 things at once (ie: managing anger and breathing normally). So when he gets overly angry, his brain can’t both control his mood/physical lashing out and tell him to keep breathing, so he passes out. This is not supposed to be permanent. The surgeon said that any of the symptoms he is experiencing can possibly be blamed on his surgery/tumor and we won’t know what until he is at least 6 months post surgery. We obviously would rather this to be a symptom of surgery and are praying that the passing out was the mental coordination and not the tumor growing or shunt malfunction. Thank you for the kind words and prayers. This morning at breakfast Judah was holding his jaws while he chewed. We asked him what was wrong and he said his mouth hurt. We asked him where it hurt and held the sides of his face. His jaws. The oncologist had told us that one of the side effects of his chemo is neuropathy in jaws, fingers/hands, and toes/feet. Please pray specifically for this to go away and stay away. Jaw pain/neuropathy on top of nausea will make him not want to eat no matter what we give him. If his calories drop we will have to go back to a feeding tube. Judah’s first chemo is this morning. Please pray that is all goes smoothly, that he has little side effects. Pray that he isn’t scared. He will have blood draws at 7:45 then meeting with the dr at 8:00 then chemo from 9-11. Thanks for the prayer support! Love you all. Judah got a little sick in the middle of the treatment but was ok by the end. They gave him zofran for nausea and we will continue that every 8hrs for the next 48 hrs. Thankfully, his immune system will not be compromised until next wks treatment but we are having to learn a lot about germs, infection, and how to protect our little family. If one of us gets sick after next week, we will have to go stay somewhere else. Gotta keep the germs away as much as possible. Investing in hand sanitizer and Clorox wipes, haha!